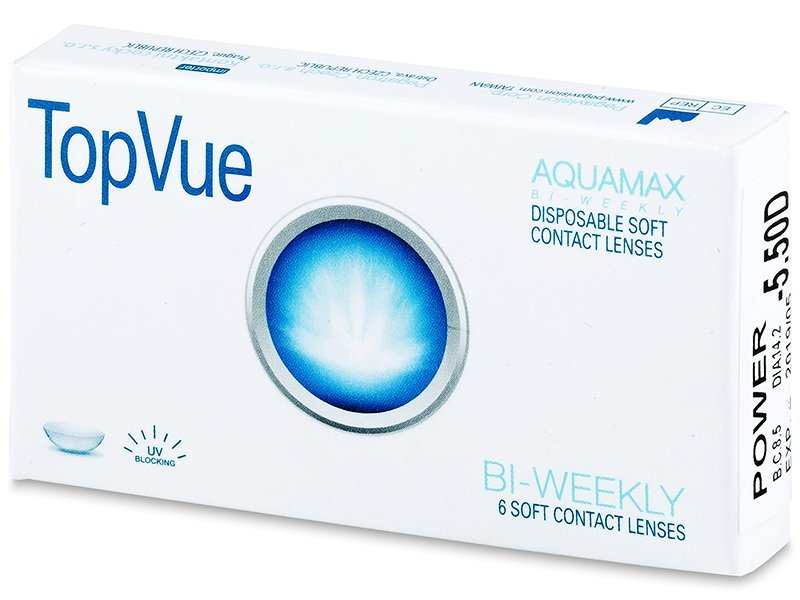 TopVue Bi-weekly contact lenses are comfortable hydrogel lenses with added sodium hyaluronate that ensures extraordinary moisture and all-day comfort. These lenses have a 14-day replacement schedule. 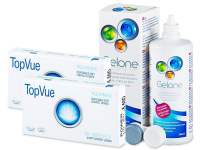 TopVue BiWeekly are comfortable, hydrogel lenses produced with two effective lubricants: sodium hyaluronate and the PEG (polyethylenglycol) wetting agent, both of which ensure extraordinary moisture and maximum all-day comfort. Sodium hyaluronate, or hyaluronic acid, is a substance natural to the human body. Besides joints and other body parts, it can be found in the vitreous humour, which is the gel-like substance that makes up the eyeball. The parameters of TopVue contact lenses suit 99% of users. TopVue contact lenses are designed with exceptionally thin edges to reduce friction between the lens and the eyelid during blinking. The eyelid comes into contact with the lens edge whenever we blink. If the edge is thick, we are aware of the presence of the lens in our eye. 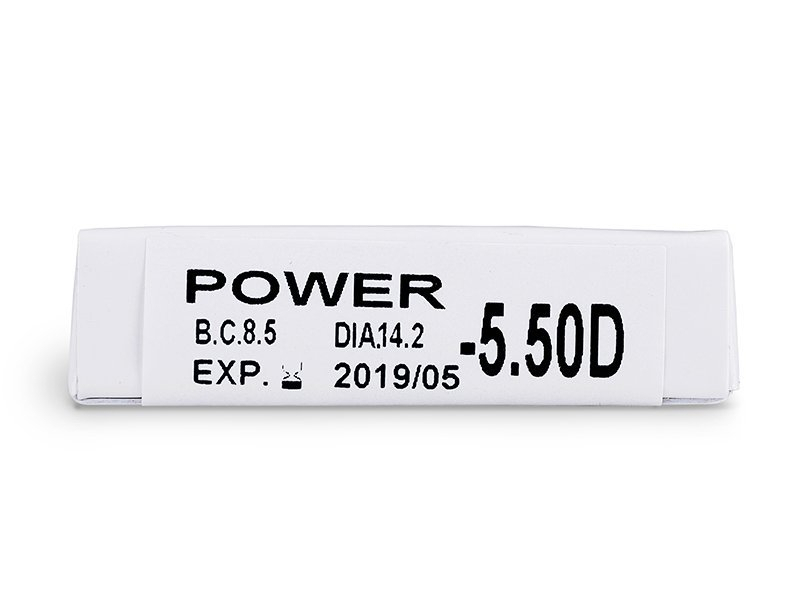 Although a seldom-discussed factor, the lens edge is a decisive factor for lens comfort. TopVue Biweekly contact lenses feature stable optical correction technology to achieve the same dioptric power within the whole optical zone. Thanks to this, the lenses provide high-quality vision in any light conditions. 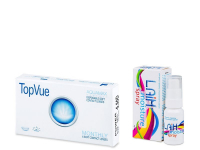 TopVue contact lenses are equipped with UV filters that absorb harmful UVA and UVB radiation. However, as the lens covers only a small part of the eyeball, it is still necessary to wear sunglasses outdoors to protect the entire eye area from sun damage. The advanced AQUAMAX technology uses a new method of applying the UV filter in the production of contact lenses, a method that has no negative impact on their properties. TopVue contact lenses have thus acquired better mechanical qualities for application (better handling) and comfort. TopVue contact lenses are not intended to be worn during sleep. At the end of the day, they must be removed, disinfected, and stored in a cleaning solution for the night. Each pair should not be worn longer than 14 days from first use. The lenses are made from Etafilcon A hydrogel material and contain 58% water. Their oxygen permeability is declared to be 26 Dk/t. Good bi-weekly lenses. They keep my eye really well hydrated. Great lenses for occasional wear. Very pleased with the comfort and ease of wear. Great for dry eyes. I'm very pleased with how they feel, even towards the end of the day. The moisture is noticable, in my opinion. Really impressive service, mates. Thanks a million for helping me through the ordering and getting me the lenses extra quick. Youve earned a repeat customer. Good lenses overall. A little bit thin, but I got used to that quickly. Fast delivery and effective communication with your customer service. I had an issue with entering my address, but it was sorted in no time. Many thanks. Thank you again for the quick responses. I am very impressed. Good lenses and can't beat the price. Very reliable service and products. I ordered these on the recommendation of a friend, and I'm very pleased with them. The order arrived quickly, and I've had no troubles with the lenses themselves. Good lenses, but I decided to try the Topvue daily lenses. Exchange was handled quickly and professionally. Thank you for a great experience. Very pleasant to wear. Handling took some getting used to, but I'm getting on brilliantly with them now. Wouldn't return to my old lenses. Great alternative to Oasys. Happy with the lenses and the services received. Very comfortable for longer wear. I've never been able to wear other brands for longer than 6-8 hours. Highly recommended. Super product. They do not dry out in my eyes, and I hardly feel them at all. Excellent service from your side and super fast delivery with DHL. 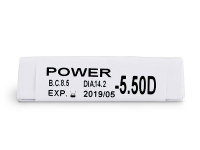 These lenses are very comfortable to wear and a good value for the money. Excellent, reliable delivery, and the "repeat order" function makes the process so much easier. I don't have to remember every detail of my prescription when I wish to reorder. Order delivered the next day, even though it wasn't specified. Quality of the lenses is good, and the experience was perfect overall. I've been using these lenses for a while now, and never had any problems with them. Overall I'd recommend this brand for the comfort and price. I've previously had problems with other lenses, as I work in a hot environment. These work brillaintly. I'll definitely stick with this brand. Rapid, trustworthy and professional service. Very much appreciated. Terrific ordering process. I received my lenses well in advance of the stated time, despite choosing Royal Mail over DHL. Thanks for the smooth transaction - P.
These have been a great substitute for the Acuvue. I'm happy to save a few quid, too. I ordered in the morning, and received the lenses via dhl the next day. Couldn't be more pleased, thank you! Excellent service, no hassle, and low prices. Great lenses, and the fast delivery really came through for me in a pinch. Cheers! Came with my order as a test pair. Quite comfortable for that price!